Home / children's picture books / community / FEATURES / friendship / I Theatre / plays / theatre / Beauty is Fin Deep: A Review of I Theatre's "The Rainbow Fish"
Beauty is Fin Deep: A Review of I Theatre's "The Rainbow Fish"
What happens if your BFF suddenly declares that you are boring and not worth her attention? What if this was the same friend that you had always looked up? 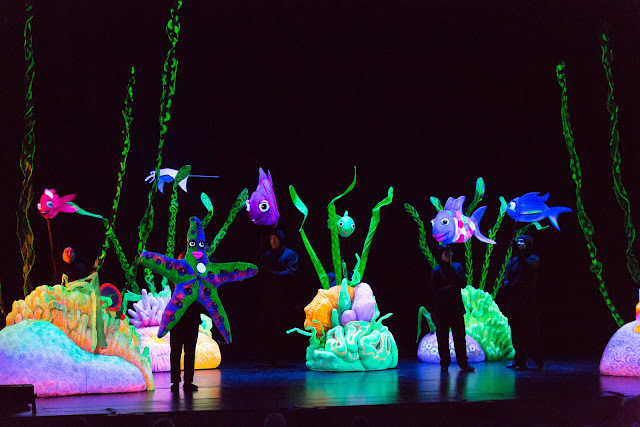 I Theatre's 15th Anniversary Production, "The Rainbow Fish", takes you to a world of adventure and exploration; of friendship and of community. Under the Sea. The fishy community welcomes you to the show! Enter Rainbow. She's a dazzling display of beauty; especially given her lovely shiny scales. And she's no less than a celebrity to all the other fishes, which makes her proud and arrogant. But the final blow is when Rainbow decides to insult her long-time fan and supporter, Small Blue, leaving him... well let's say our little friend was feeling more than a little blue.... What if no one ever talked to her again? Is it too late for Rainbow? Will she live a forever friendless life? "Bubble Bubble...." says the Starfish. "I can't hear you...."
I Theatre's Brian Seward is nostalgic about this production, given that it is one of the company's groundbreaking plays, and that it has been staged a grand total of seven times! 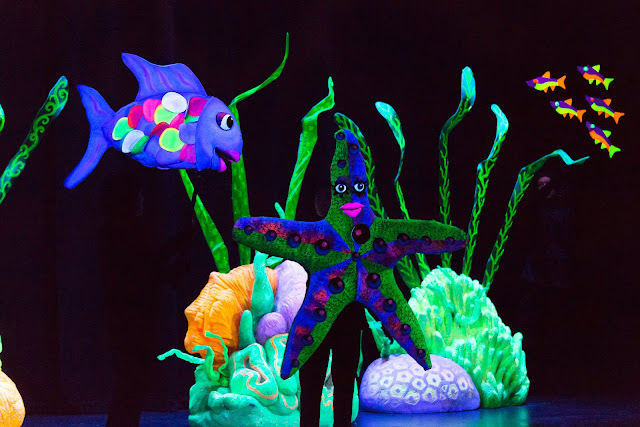 It is indeed evident from our viewing of the show that I Theatre has gone to great lengths to ensure that "The Rainbow Fish" encapsulates what the company has learnt over its fifteen year history. 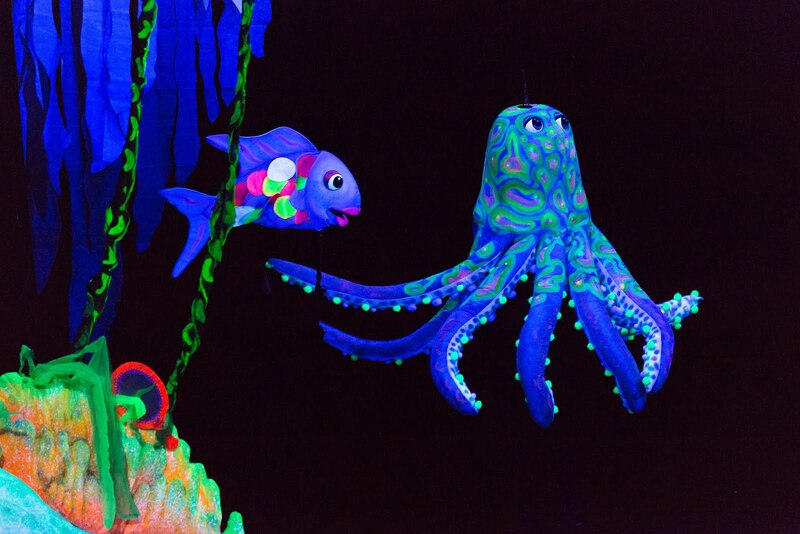 What catches your attention at once is the black light theatre effect. The ocean scenescape is gorgeously beautiful; complete with floating seaweed and luminous rocks. And if you layer in a pageantry of delightful fishy puppets, the impact is at once stunning as it is breathtakingly beautiful. 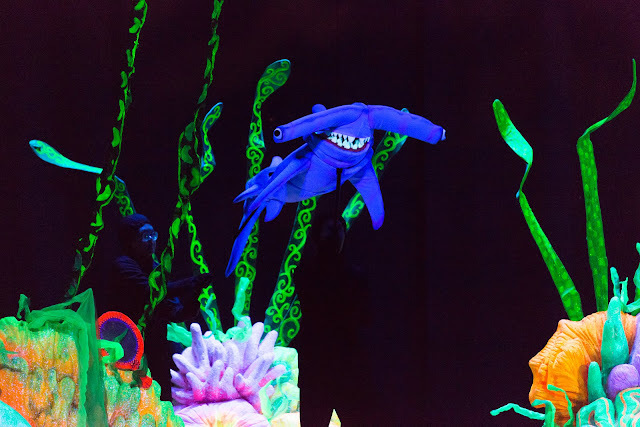 I Theatre has also masterfully melded in the actors, so that all you see are the talking (and singing) fishes, and the player become one with the puppet; creating a spectacular illusion of an ocean wonderland in all its dazzling glory. Credit must be given to Set Designer Yu Hsien Chia and Puppet Creator Paul Pistore for their imagination in bringing to life the lovable characters created by Swiss author and illustrator Marcus Pfister. Be dazzled by the spectacular visual effects of black light theatre! As in all I Theatre productions, scriptwriter Brian Seward always injects a moral into the story. An educator at heart, Seward has chosen this production to infuse the value of sharing (with a song to highlight how Sharing is Not Stupid), and of teamwork (how a common enemy can be defeated if friends choose to share their resources). There are also deeper concerns related to narcissism and identity as well as loneliness and self esteem, and these are skilfully imbued into the storyline. For many of the children in the audience, it was humour that won their hearts. For instance there is a pun on what being "unique" means, and there is also a Squid which makes a funny explosive sound in order to escape from the scary Hammerhead Shark (our almost 4-year-old E was particularly tickled by the Squid and the funny noise that he makes). And being a Japanese food enthusiast, this writer especially enjoyed the Japanese-accented Hammerhead and his exclamations of "sushi" and "sashimi" whenever he attempted to catch the fish. As for our almost-6-year-old Z, his favourite character in the play was the wise Octopus, saying that the creature was very large and very beautiful. 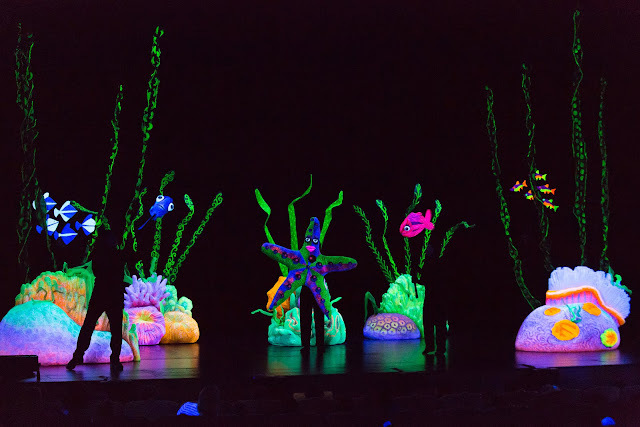 Perhaps that's what a good theatre production is all about - being larger-than-life, and transporting the audience to a different world, one where they can be fascinated and awed all at the same time! "Sashimi! Ha Ha Ha! I love seafood!" An encounter with the Wise Old Octopus. The Rainbow Fish runs from now to 15 May 2016 at the Drama Centre Theatre. Parenting on Purpose was provided with show tickets for a blog review. All opinions expressed here are solely ours.